London - While a world record was not part of his plans, Oscar Pistorius had a point to prove to his “long-legged” friends in the men’s 200m T43/44 heats at the Paralympic Games on Saturday night. 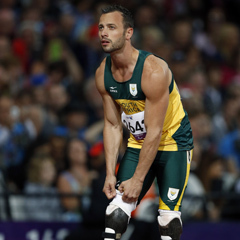 Double amputee Pistorius clocked 21.30 seconds to improve his own global mark in the T43 division. “I don’t even know what to say as I would never have guessed that I’d run a world record tonight,” Pistorius said after the heats. “I eased off about 20m from the end as I knew I was comfortable and wanted to conserve energy for tomorrow. While Pistorius had to overcome many obstacles to make his historic debut at the able-bodied Olympic Games a few weeks ago - and still has his critics who claim his prosthetic legs give him an advantage over the other athletes - he now faces similar reservations about some of his competitors as another controversy bubbles under the surface. “There is definitely something up with the length of the prosthetic legs,” Pistorius commented on Brazil’s Alan Fonteles Cardoso Oliveira who won the first heat in 21.88 seconds, storming clear of American favourite Jerome Singleton in the finishing straight. “I’ve said it before - the rules allow the guys to make themselves longer. “If you look at the videos from last year, Alan was shorter than me but now he’s taller than me. “The same with Blake Leeper, and it’s a problem because the rules allow the guys to make themselves a lot longer - longer than what they would have been [had they not been double amputees]. “So it is difficult because you saw Blake Leeper five metres behind Arnu Fourie on the straight and then he finished three metres ahead of him. “We’ve tried, as athletes, to say something but I don’t know what’s happening there. Fellow South African Fourie, a single-leg amputee, finished 0.34 seconds behind Leeper and set a new world best in the 200m T44 division, clocking 22.57 in his heat. “Arnu is a phenomenal guy and a great competitor,” Pistorius said of his room-mate. Pistorius said he was aware that his critics said he could not train for both the Olympics and the Paralympics and he hoped his performance on the track proved them wrong. “Everybody was saying I don’t care about the Paralympic Games and I can’t peak for both, but I’ve proved everybody wrong tonight. “There were people who doubted my goals but go and look at the clock --it says 21.30. “The last two days I’ve been overwhelmed just thinking about coming back out here and I’ll tell you what, the crowds are exactly the same. “They are so passionate and excited that it feels just like it did during the Olympics. “For first-time Paralympian athletes, I’m quite envious of them because it hasn’t always been this way.